 A surprisingly original study of the literary estates of many famed writers, and a look at the tangled relationship between estate management and biography. 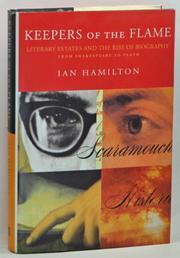 Hamilton wrote the strong Robert Lowell (1982) and the admirable In Search of J.D. Salinger (1988). Estates that Hamilton looks into include those of John Donne the Younger, Shakespeare, Marvell, Milton, Pope, Boswell, Robert Burns, Byron, Dickens, Tennyson, Swinburne, Robert Louis Stevenson, Henry James, Hardy, Kipling, Joyce, Eliot, and Sylvia Plath. John Donne made no mention of his poems in his will and, thinking them a young man's ``evaporations'' and ``vanities,'' would have preferred that these sins be destroyed. Following his death, Shakespeare's plays were edited by two fellow actors and ``set forth according to their first originals,'' as these friends put it, saving eighteen of Shakespeare's plays from oblivion (including King Lear, The Tempest, and Macbeth) and several others, according to Hamilton, from being handed down in ``irretrievably corrupt'' texts. While poets' posthumous papers gave rise to biography, Dr. Johnson wrote his hasty Lives of the Poets to consolidate publishers' copyrights on various posthumous materials. Meanwhile, Boswell took down Johnson's table talk for his monumental Life of Johnson (Macauley later damned Boswell as a drunkard, pipsqueak, and lickspittle), then left a hoard of journals and Boswelliana that engendered the great Boswell papers saga. Hamilton follows the styles of biography as one mode rises over the body of earlier modes: the Victorian biography, for instance, reflects the newly emerging Romantic concept of the artist. Dickens writes long letters to his future ``beeograffer,'' John Forster. Joyce appoints his benefactress Harriet Shaw Weaver as his literary executor; she also inherits his mad daughter. Eliot directed that there should be ``no biographies,'' and his estate will not go public until 2015. Ted Hughes' trial-by-gravestone bequeathed him by Sylvia Plath is quite moving. As a commentary on literary mortality, and on biography and trumpery, this is book is a treasure.